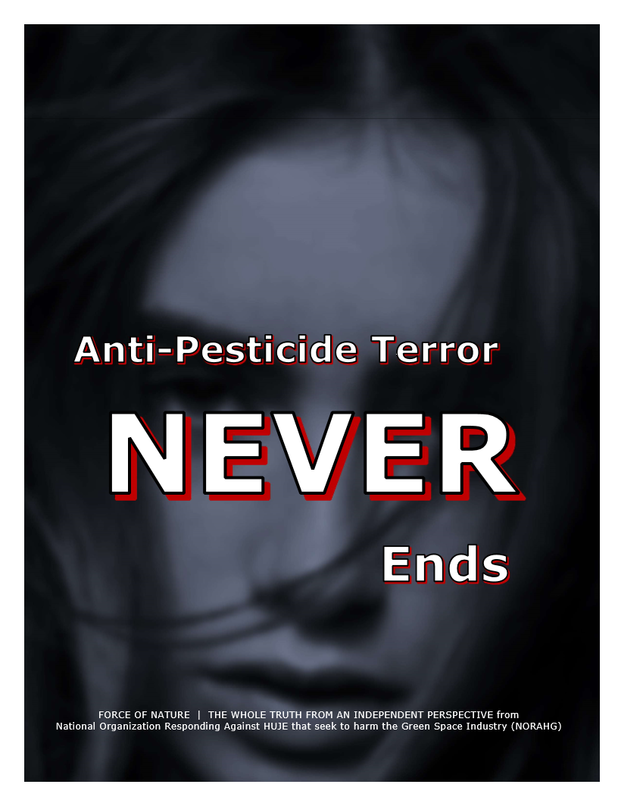 With Anti-Pesticide Terrorism That NEVER Ends ? The REIGN OF ANTI-PESTICIDE TERRORISM continues in British Columbia ( BC ). LEGITIMATE AND TAX-PAYING BUSINESSES ARE BEING TERRORIZED BY ANTI-PESTICIDE LUNATICS ! They DEMAND MORE PROHIBITION against pest control products used in the Urban Landscape. Who are some of these #@! !% Lunatics ?!?! What are their organizations ?!?! These Anti-Pesticide & Environmental-Terrorist Organizations are the PRINCIPAL ARCHITECTS of the CONSPIRACY CAMPAIGNS TO RECKLESSLY PROHIBIT pest control products used in the Urban Landscape ― and they have consequently FORFEITED THEIR CHARITY TAX-EXEMPT STATUSES because they are IN VIOLATION OF TAXATION LAWS. WCEL, Wildsight, and CAPE have FALSELY ALLEGED to be Health And Environmental Organizations. In fact, they operate AS MERE FUND-RAISING, PROFIT-SEEKING, and LOBBYING ORGANIZATIONS. 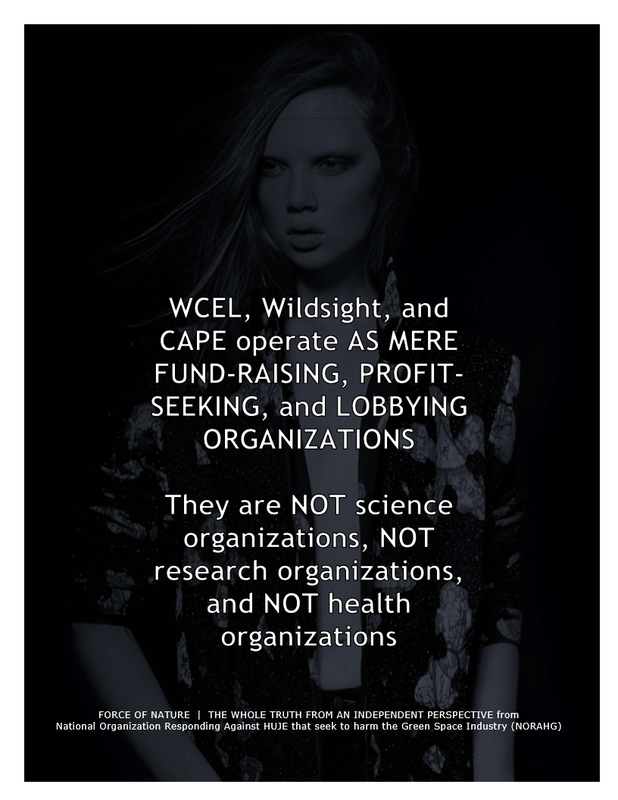 WCEL, Wildsight, and CAPE are NOT science organizations, NOT research organizations, and NOT health organizations. NONE has ANY expertise in matters concerning pest control products. They DO NOT even have expertise on environmental issues. More precisely, Canadian Association Of Physicians For The Environment ( CAPE ) is NOT EVEN A PHYSICIANS’ ORGANIZATION since the VAST MAJORITY OF CAPE MEMBERS ARE NOT EVEN PHYSICIANS. CAPE represents an INFINITESIMALLY SMALL NUMBER OF DOCTORS, LESS THAN 4 PER CENT OF ALL DOCTORS in Canada. The DEMAND for ARBITRARY AND RECKLESS PROHIBITION has been endorsed by so-called Health And Environmental Organizations. WCEL, Wildsight, and CAPE FALSELY ALLEGE to be Health And Environmental Organizations. In fact, so-called Health And Environmental Organizations represent a MERE LUNATIC-COALITION of Anti-Pesticide & Environmental-Terrorist Organizations that are quite often SHIELDS for WCEL, Wildsight, and CAPE. See above for the MOCK-ADVERTISEMENT created by this LUNATIC-COALITION. In reality, WCEL, Wildsight, and CAPE created this LUNATIC-COALITION to give everyone the impression that they have considerable size and power, when in fact, they represent ONLY A FEW DOZEN Radical Anti-Pesticide Lunatics, including Andrew Gage, Robyn Duncan, and Gideon Forman. Because of their affiliation with this Anti-Pesticide and Environmental-Terrorist Organizations, Gage, Duncan, Forman, and others, are affectionately referred to as Anti-Pesticide LUNATICS. 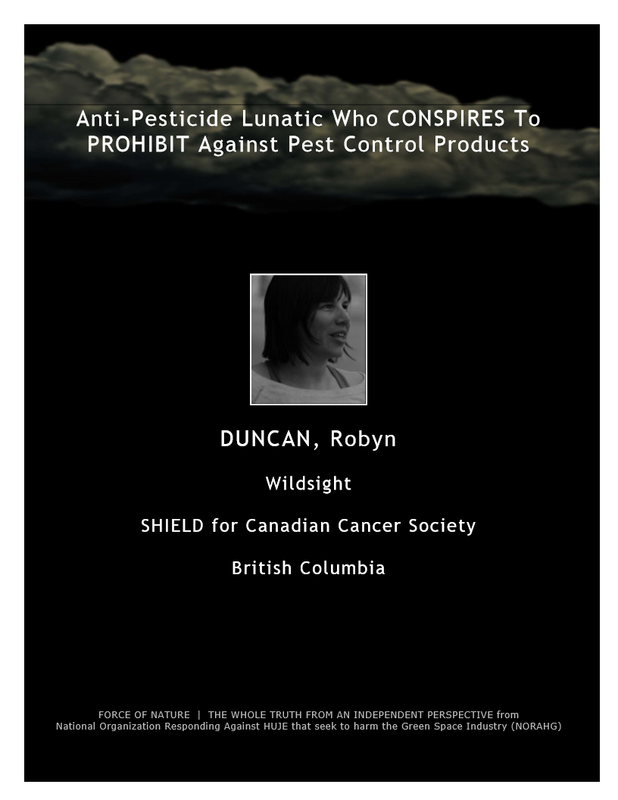 The RECKLESS LUNATIC ACTS OF SUBVERSION by Gage, Duncan, Forman, and others, led to the ARBITRARY IMPOSITION of Anti-Pesticide PROHIBITION in several MUNICIPAL jurisdictions throughout British Columbia. In British Columbia, as a direct result of MUNICIPAL PROHIBITIONS, Professional Lawn Care companies have LOST OVER 40 PER CENT OF THEIR CUSTOMERS. However, Gage, Duncan, Forman, and others, FAILED TO FORCE THE GOVERNMENT OF BRITISH COLUMBIA TO IMPOSE PROVINCE-WIDE PROHIBITION. 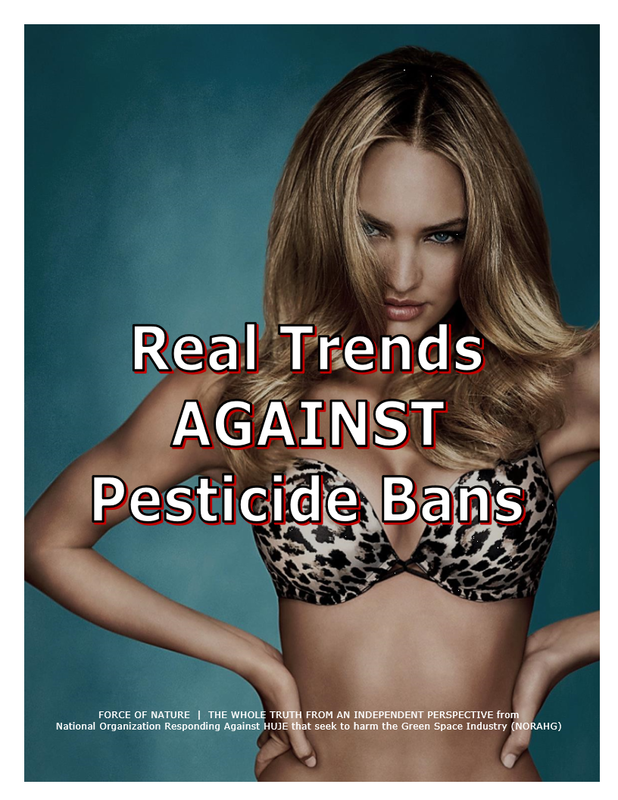 This because there are now TRENDS AGAINST PESTICIDE BANS. NO ONE WANTS THIS #@! !% BAN NONSENSE ! On February 20th, 2013, legislation was introduced in British Columbia that would GRANT an EXCEPTION STATUS to businesses operating in the Professional Lawn Care and Golf Industries. The government’s decision was based upon the work of one of its Special Committees. British Columbia’s decision CONFIRMS THAT THE PUBLIC REJECTS PROHIBITION. The POLL CONFIRMED that the VAST MAJORITY of residents in British Columbia are OPPOSED to the PROHIBITION. The ONLY people who want PROHIBITION are a SMALL GROUP of activists with VESTED INTERESTS IN CONCOCTING IMAGINARY DANGER against pest control products. THE TRENDS AGAINST PESTICIDE BANS CONTINUE. NO ONE CAN AFFORD THIS #@! !% NONSENSE ! 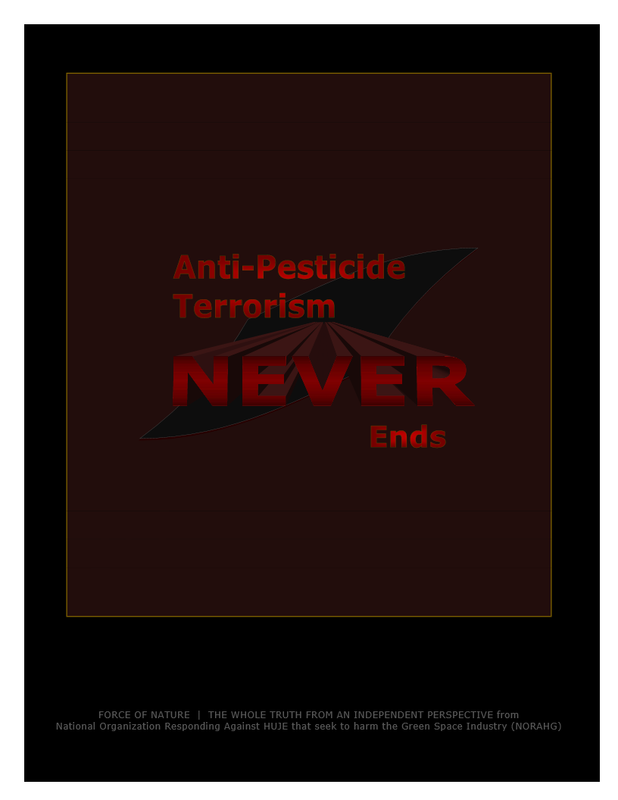 Anti-Pesticide & Environmental-Terrorist Organizations are mere FUND-RAISING, PROFIT-SEEKING, and LOBBYING organizations, and NOT science, research, or health organizations. They serve NO USEFUL OR BENEFICIAL PURPOSE TO SOCIETY, WASTING TAX-PAYER MONEY OPERATING AS MERE GOVERNMENT OPPONENTS, and DO NOT DESERVE CHARITY TAX-EXEMPT STATUSES. 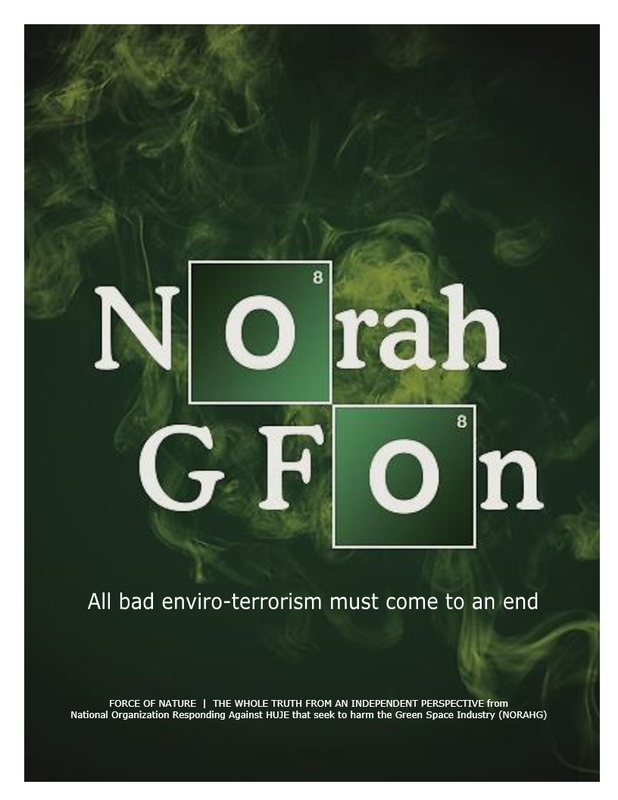 In Canada, Anti-Pesticide & Environmental-Terrorist Organizations are presently UNDER INVESTIGATION FOR CHARITY FRAUD AND CONSPIRACY. The Government of Canada has allocated 8 MILLION DOLLARS for the Canada Revenue Agency to ensure that NO MORE THAN 10 PER CENT OF FUNDS IS BEING SPENT ON ADVOCACY. The tax-payer tap pouring cash into the coffers of government opponents will be turned off. If it’s the case that we’re spending on organizations that are doing things CONTRARY TO GOVERNMENT POLICY, I think that is an INAPPROPRIATE USE OF TAX-PAYER MONEY and we will look to ELIMINATE it. It is INAPPROPRIATE for Anti-Pesticide & Environmental-Terrorist Organizations to SQUANDER TAX-PAYER MONEY in order to OPPOSE the Government of Canada. It is INAPPROPRIATE for Anti-Pesticide & Environmental-Terrorist Organizations to SQUANDER TAX-PAYER MONEY in order to DISCREDIT Health Canada and its registration policies concerning pest control products. It is INAPPROPRIATE for Anti-Pesticide & Environmental-Terrorist Organizations to SQUANDER TAX-PAYER MONEY in order to INTERFERE WITH PARTISAN POLITICAL ACTIVITIES AND PUBLIC POLICY, WHICH IS IN VIOLATION OF TAXATION LAWS. It is INAPPROPRIATE for Anti-Pesticide and Enviro-Lunatic Terrorist Organizations to SQUANDER TAX-PAYER MONEY in order to CONSPIRE TO IMPOSE NEEDLESS, SENSELESS, and MALICIOUS PROHIBITION against pest control products that are otherwise GOVERNMENT-APPROVED, SCIENTIFICALLY SAFE, PRACTICALLY NON-TOXIC, and CAUSE NO HARM. 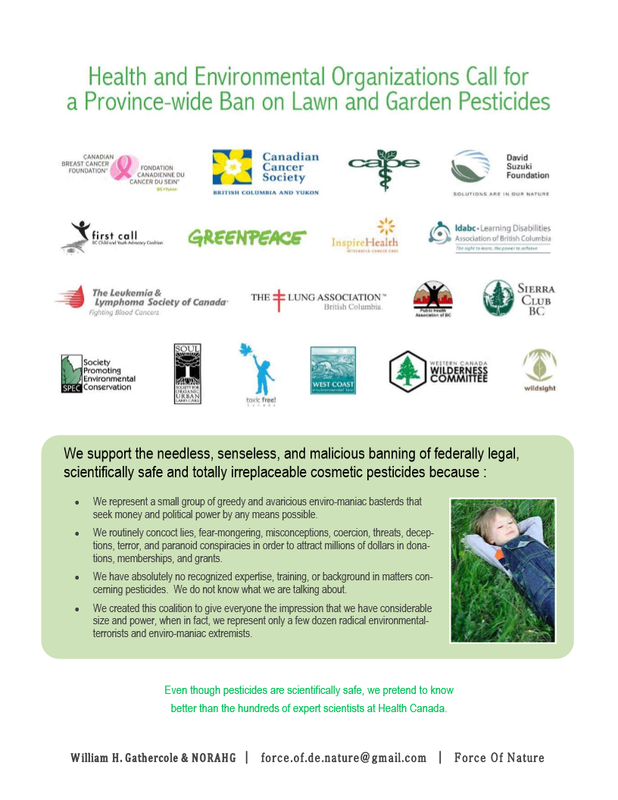 It is INAPPROPRIATE for Anti-Pesticide & Environmental-Terrorist Organizations to SQUANDER TAX-PAYER MONEY in order to DESTROY the businesses operating in the Professional Lawn Care Industry in ALL jurisdictions across Canada, including British Columbia, Halifax Regional Municipality, Ontario, and Quebec. It is INAPPROPRIATE for Anti-Pesticide & Environmental-Terrorist Organizations to SQUANDER TAX-PAYER MONEY in order to TERRORIZE decent, honest, hard-working, and tax-paying people in the Professional Lawn Care Industry. Consequently, PROMINENT Anti-Pesticide & Environmental-Terrorist Organizations are being INVESTIGATED, and CHARITY TAX-EXEMPT STATUS ARE BEING REVOKED. Anti-Pesticide & Environmental-Terrorist Organizations MUST SUFFER THE SCRUTINY OF THE MEDIA AND THE SPOTLIGHT OF CANADA REVENUE AGENCY. Who Is Andrew Gage ?!?! 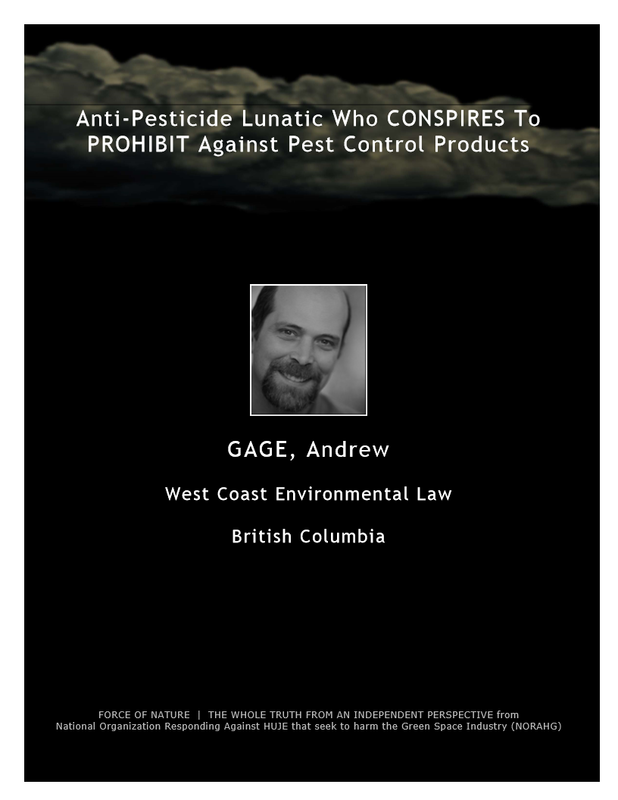 The ONLY people who want PESTICIDE BANS in British Columbia are a SMALL GROUP of activists like Andrew Gage with VESTED INTERESTS IN CONCOCTING IMAGINARY DANGER against pest control products. Anti-Pesticide Activists like Andrew Gage have HUGE VESTED INTERESTS IN PERPETUATING IMAGINARY DANGERS against pest control products BECAUSE THEY ARE PAID TO DO SO. Moreover, Anti-Pesticide Activists like Andrew Gage are THE LEAST QUALIFIED TO PROVIDE ANY ADVICE concerning pest control products. They are NOT CREDIBLE EXPERTS on pest control products. Andrew Gage himself has NO recognized expertise, training, or background in matters concerning pesticides or the environment. Andrew Gage operates as a MERE Hired-Gun or Lobbyist ( a.k.a. Enviro-Lawyers ) for West Coast Environmental Law. What Is West Coast Environmental Law ( WCEL ) ?!?! 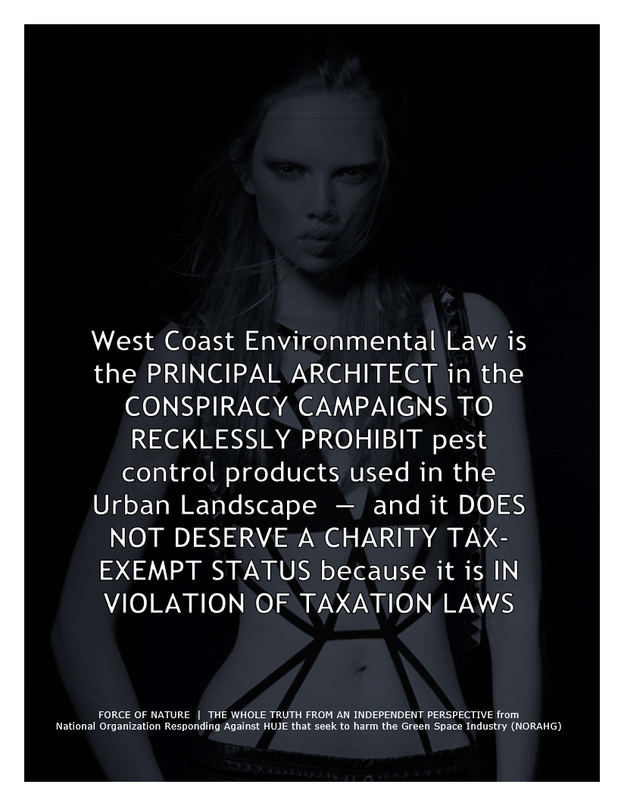 West Coast Environmental Law is the PRINCIPAL ARCHITECT in the CONSPIRACY CAMPAIGNS TO RECKLESSLY PROHIBIT pest control products used in the Urban Landscape ― and it DOES NOT DESERVE A CHARITY TAX-EXEMPT STATUS because it is IN VIOLATION OF TAXATION LAWS. West Coast Environmental Law has done so with the benefit of NOT PAYING A SINGLE PENNY IN TAXES. There should be NO MORE FREE MONEY FOR LYING AND TERRORIZING. As with ALL such organizations, the VAST MAJORITY OF WCEL CHARITY DONATION MONEY goes to paying for Hired-Guns or Lobbyists ( a.k.a. Enviro-Lawyers ) like Andrew Gage and clerical employees, who are affectionately known as WCEL-Lunatics. These WCEL-Lunatics ILLEGALLY INTERFERE IN PARTISAN POLITICS AND PUBLIC POLICY, and consequently are IN VIOLATION OF TAXATION LAWS. Their SUBVERSIVE CONSPIRACY CAMPAIGNS AND POLITICAL INTERFERENCE SERVE NO USEFUL PURPOSE TO SOCIETY. West Coast Environmental Law has SQUANDERED VAST SUMS OF CHARITY DONATION MONEY ON SUBVERSIVE ANTI-PESTICIDE CONSPIRACY CAMPAIGNS BASED UPON ALLEGATIONS OF UNDISCLOSED, NON-EXISTENT, AND UNVERIFIABLE SECRET EVIDENCE about the safety of pest control products. For example, West Coast Environmental Law CONSPIRES to RECKLESSLY, ARBITRARILY, and MALICIOUSLY IMPOSE PROHIBITION against pest control products used in the Urban Landscape. 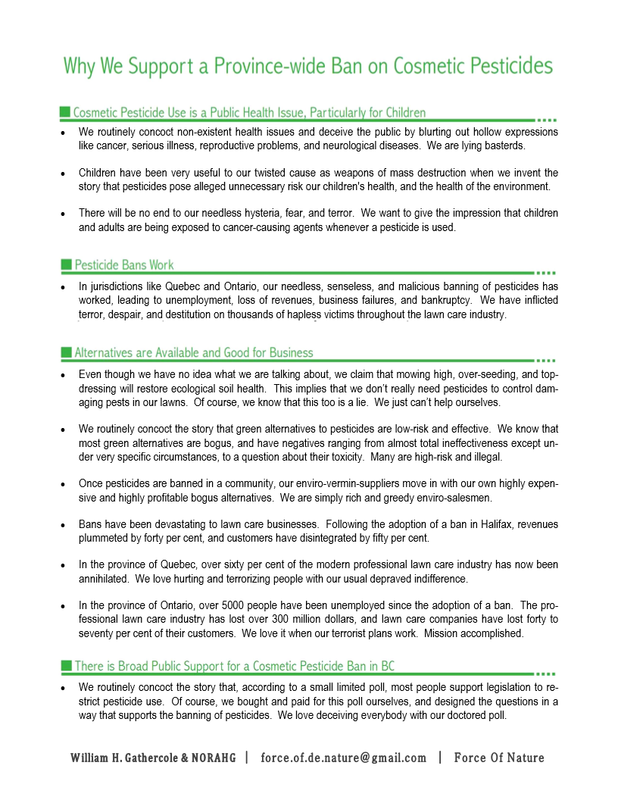 West Coast Environmental Law’s ANTI-PESTICIDE ACTS OF SUBVERSION have EXTENSIVELY DAMAGED and TERRORIZED and DESTROYED the Professional Lawn Care Industry in British Columbia. West Coast Environmental Law has SQUANDERED AND MISAPPROPRIATED DONATIONS and GOVERNMENT GRANTS in order to finance SUBVERSIVE ANTI-PESTICIDE CONSPIRACY CAMPAIGNS. West Coast Environmental Law’s SUBVERSIVE ANTI-PESTICIDE CONSPIRACY CAMPAIGNS are now considered as INTERFERENCE IN PARTISAN POLITICAL ACTIVITIES AND PUBLIC POLICY, WHICH IS IN VIOLATION OF TAXATION LAWS. It is easy for West Coast Environmental Law TO INTERFERE IN PARTISAN POLITICS AND PUBLIC POLICY when it has ALMOST UNLIMITED RESOURCES WITH MILLIONS OF DOLLARS AVAILABLE THROUGH PUBLIC DONATIONS AND GOVERNMENT GRANTS, AS WELL AS FOREIGN FUNDING. As a REGISTERED CHARITY THAT PAYS NO TAXES, West Coast Environmental Law CANNOT LEGALLY INTERFERE IN PARTISAN POLITICS AND PUBLIC POLICY, such as the PROHIBITION of pest control products. The rules at the CANADA REVENUE AGENCY are clear … West Coast Environmental Law CANNOT INTERFERE IN PARTISAN POLITICS AND PUBLIC POLICIES on issues such as Anti-Pesticide PROHIBITION. If organizations like West Coast Environmental Law want to VIOLATE TAXATION LAWS, INTERFERE WITH PARTISAN POLITICS, and OPERATE AS ANTI-PESTICIDE AND ENVIRO-LUNATIC TERRORISTS, then their CHARITY TAX-EXEMPT STATUS SHOULD BE REVOKED. Furthermore, demands have been repeatedly made for West Coast Environmental Law’s registered charity tax-exempt status to be TOTALLY REVOKED. ITS CHARITY TAX-EXEMPT STATUS MUST BE INVESTIGATED AND REVOKED. West Coast Environmental Law SERVES NO USEFUL PURPOSE, and DOES NOT DESERVE A CHARITY TAX-EXEMPT STATUS. West Coast Environmental Law MUST SUFFER THE SCRUTINY OF THE MEDIA AND THE SPOTLIGHT OF CANADA REVENUE AGENCY. West Coast Environmental Law … WHAT IS IT FOR ? West Coast Environmental Law has NEVER provided ANY credible information to Health Canada to justify its SUBVERSIVE ANTI-PESTICIDE CONSPIRACY CAMPAIGNS. West Coast Environmental Law is NOT PROVIDING ANY INFORMATION THAT IS FACTUAL. Incredibly, West Coast Environmental Law implies that Health Canada is LYING TO THE PUBLIC. NO LEADING EXPERTS WERE EVER CONSULTED by West Coast Environmental Law, and yet, it CONCOCTS IMAGINARY DANGER about pest control products. Moreover, West Coast Environmental Law has NO qualified laboratories or experts for testing pest control products. In fact, NO ONE at West Coast Environmental Law has ANY expertise, training, or background in matters concerning pest control products. The opinions of WCEL-Lunatics are ABSOLUTELY VALUELESS and UTTERLY WORTHLESS. West Coast Environmental Law operates as a mere FUND-RAISING ORGANIZATION that sometimes launches some WORTHLESS OR FRIVOLOUS LEGAL ACTION. West Coast Environmental Law is NOT a science and is NOT a research organization. What is the problem with these WCEL-Lunatics ?!?!?! INDISPUTABLE and CONCLUSIVE SCIENTIFIC RESEARCH shows that, as reported through EPA’s and Health Canada’s VAST TOXICOLOGY DATABASE, NO HARM WILL OCCUR when pest control products are used according to label directions. West Coast Environmental Law should LEAVE THE FACTS ON PESTICIDE SAFETY UP TO THE REAL EXPERTS AT HEALTH CANADA. Health Canada, and NOT West Coast Environmental Law, has THE ESSENTIAL EXPERTISE on the subject of pest control products. Pest control products are HEALTH-CANADA-APPROVED, FEDERALLY-LEGAL, SCIENTIFICALLY-SAFE, and PRACTICALLY-NON-TOXIC, and CAUSE NO HARM. West Coast Environmental Law should GET OFF OUR grASS ! Who Is Robyn Duncan ?!?! She is PAID as an activist by WILDSIGHT, one of several organizations operating as SHIELDS for Canadian Cancer Society. SHIELDS are used by Canadian Cancer Society to perform ACTS OF FRAUD, CONSPIRACY, and SUBVERSION without the actions being attributed to the parent organization. Duncan is affectionately referred to as a CANCER-LUNATIC. Moreover, Duncan has NO recognized expertise, training, or background, in matters concerning pest control products. In fact, Duncan’s only educational background is in ECONOMICS. She is a NON-PRACTICING AND FAILED ECONOMIST ! Consequently, her opinion concerning pest control products is TOTALLY VALUELESS and UTTERLY WORTHLESS. According to Duncan, Anti-Pesticide PROHIBITION somehow does not destroy Professional Lawn Care companies. Duncan is a LUNATIC-LIAR ! Duncan also ALLEGES that Professional Lawn Care companies are somehow reporting an increase in business. Again, Duncan is a LUNATIC-LIAR ! Who Is Gideon Forman ?!?! 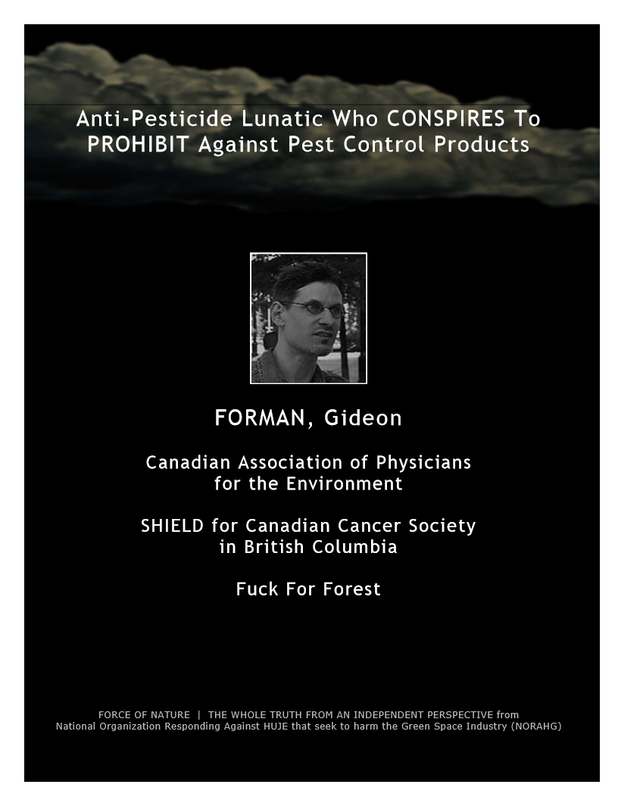 Gideon Forman LIES, CHEATS, AND MIS-INFORMS about pest control products and the environment. Forman has NO recognized expertise, training, or background in these matters. Forman DOES NOT KNOW WHAT HE IS TALKING ABOUT. Forman is NOT A CREDIBLE EXPERT, he is NOT COMPETENT, and he is THE LEAST QUALIFIED TO PROVIDE ANY ADVICE. Forman COMPENSATES for his LACK-OF-CREDIBILITY and INCOMPETENCE by becoming a COMPULSIVE LIAR. Sadly, Forman has the means to LIE, but he has NO REAL FACTS TO LIE WITH. Moreover, Forman has HUGE VESTED INTERESTS IN LYING because HE IS PAID TO DO SO. Forman will LIE and SAY ANYTHING in order to get his PROFITS. Basically, Forman operates as a MERE HIRED GUN AND ILLEGAL LOBBYIST AND FUND-RAISER for organizations like Canadian Association Of Physicians For The Environment ( CAPE ) and Canadian Cancer Society. He is PAID-FOR-PROFIT to COERCE, INTIMIDATE, and TERRORIZE the public by CONCOCTING FRAUDULENT LIES and INVENTING IMAGINARY DANGER. Incredibly, Forman has ALMOST UNLIMITED RESOURCES AND MILLIONS OF DOLLARS AVAILABLE through Canadian Cancer Society and Government Grants. CAPE DOES NOT PAY A SINGLE PENNY IN TAXES. Canadian Association Of Physicians For The Environment is the PRINCIPAL ARCHITECT in the CONSPIRACY CAMPAIGNS TO PROHIBIT pest control products used in the Urban Landscape ― and it DOES NOT DESERVE A CHARITY TAX-EXEMPT STATUS because it is IN VIOLATION OF TAXATION LAWS. CAPE DOES NOT DESERVE A CHARITY TAX-EXEMPT STATUS. CAPE DO NOT DESERVE ANY DONATIONS OR SUPPORT, and are presently under investigation for CHARITY FRAUD AND CONSPIRACY. Forman’s organizations MUST SUFFER THE SCRUTINY OF THE MEDIA AND THE SPOTLIGHT OF CANADA REVENUE AGENCY. 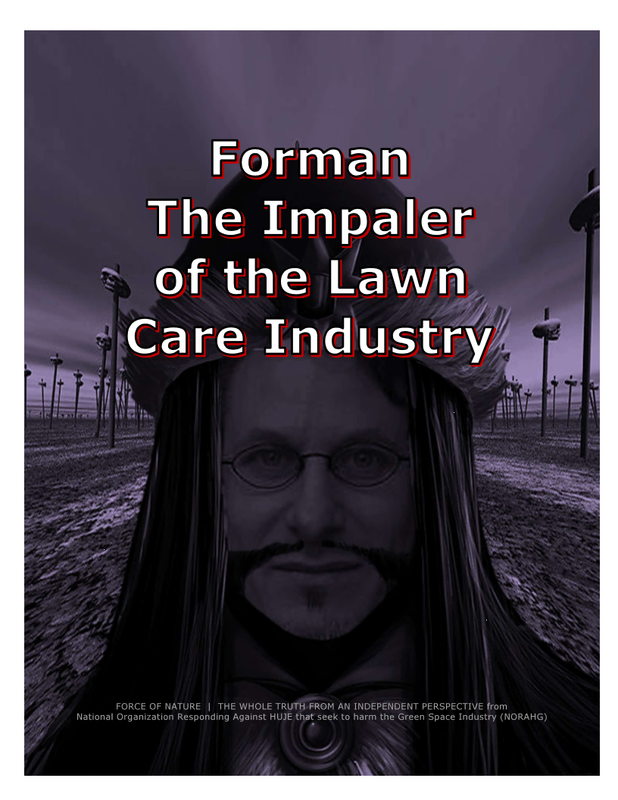 He is INTENT ON EARNING THE NICK-NAME OF « FORMAN THE IMPALER OF THE LAWN CARE INDUSTRY ». Why ? Forman is responsible for the DESTRUCTION of MORE BUSINESSES than any other person on the planet. With organizations like MILLIONAIRE Canadian Association Of Physicians For The Environment ( CAPE ) and Canadian Cancer Society, it is easy for Forman TO HAVE PULL when he is SO HIGHLY MOTIVATED IN DESTROYING BUSINESSES. In fact, CAPE is not a physicians’ organization since the vast majority of CAPE members are not even physicians. CAPE represents an infinitesimally small number of doctors. Forget about the MYTHS perpetuated by Forman. We are living in the 9|11 Era of Anti Pesticide and Environmental Terrorism where at least ONE SUBVERSIVE ACT OF TERROR is perpetrated EVERY SINGLE DAY.